If possible, your trip to Pakistan needs to include a day (or many) in the Hunza Valley. In this article I will give you details on things to do and food to eat in one ultimate day in the Hunza Valley. You can watch this entire day of attractions and authentic food in Hunza Valley in this video. Gilgit-Baltistan (called GB) is the Northernmost province in Pakistan. It is home to Hunza, some of the most amazing scenery on the entire earth, and a day spent there is like a day from a dream. A complete experience in Hunza would have to include scenery, culture, some history, and of course, a lot of authentic and local Hunza food (traditionally know for its long life properties). 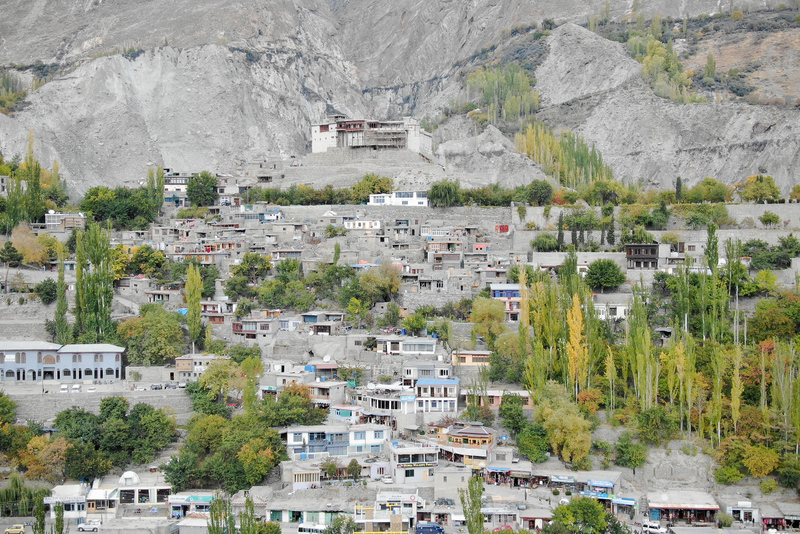 Here are your 9 Things to Do to make the most of your day in the Hunza Valley. Accommodation in Hunza Valley: Thank you to Hunza Serena Inn for sponsoring our hotel accommodation stay in Hunza Valley. It’s one of the best places to stay, with great hospitality, comfortable rooms, and a spectacular view. We had a fantastic stay. If I told you a story about hiking on a 6,000 meter peak, would you be impressed? Anywhere else, I’m sure you would – but not in Hunza! In Hunza, the mountains are so incredibly massive, most peaks under 20,000 feet aren’t even tall enough to have a name. From the town of Karimabad, you can see three of the world’s highest mountain peaks – Bublimotin or Ladyfinger Peak (7,400m), Ultar Sar (7,500m), and the stunning Rakaposhi (7,788m). 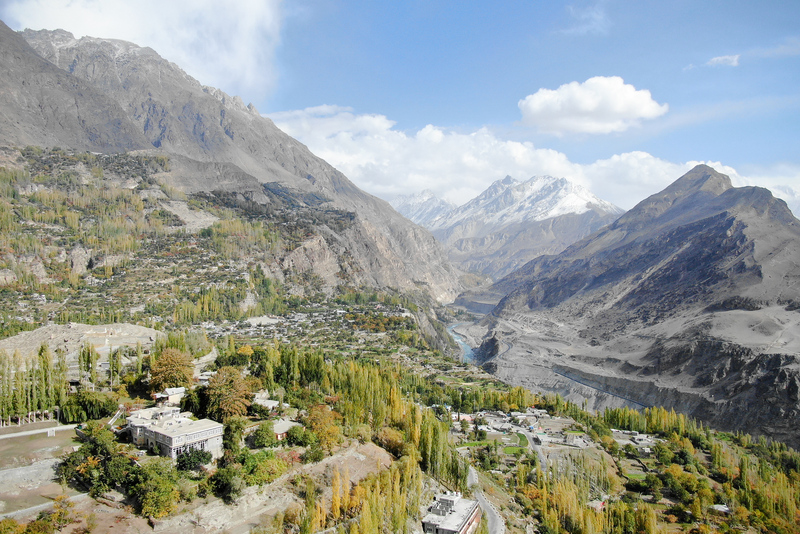 On a clear day, look South from Karimabad town (the sun’s rays will be coming from your left), and see the towering white form of Rakaposhi looking down on the entire Hunza valley. If the mountain peak is not visible, it is still worth waking up early, because that means more time to get excited about breakfast. Gyal is a traditional local breakfast food, wheat pan-fried cakes with honey or fruit jam and the local favorite ingredient, apricot oil. The apricot oil creates such a sweet aroma to go with the smoky flavors from the charcoal or wood used in cooking. There are several different types of gyal, and the thing I love about this dish is how it is so simple and hearty, the perfect combination for a morning cup of buttery hot milk tea. Honestly this is one of the tastiest breakfast foods ever, and I am not entirely sure I can name all the parts. Almonds, Walnuts, Brown Flaxseed, and Apricot Seeds, all roasted perfectly and then ground, sprinkled over a combination of barley and a local species of wheat germ. We stayed at the Serena Hotel, where the breakfast options included all of these dishes and more. If you aren’t staying at a hotel, then the Karimabad market is the most likely place to find the dishes mentioned above. If you do visit this market, also worth trying are Mantu/Mantou (a Chinese-style meat-filled wheat dumpling). 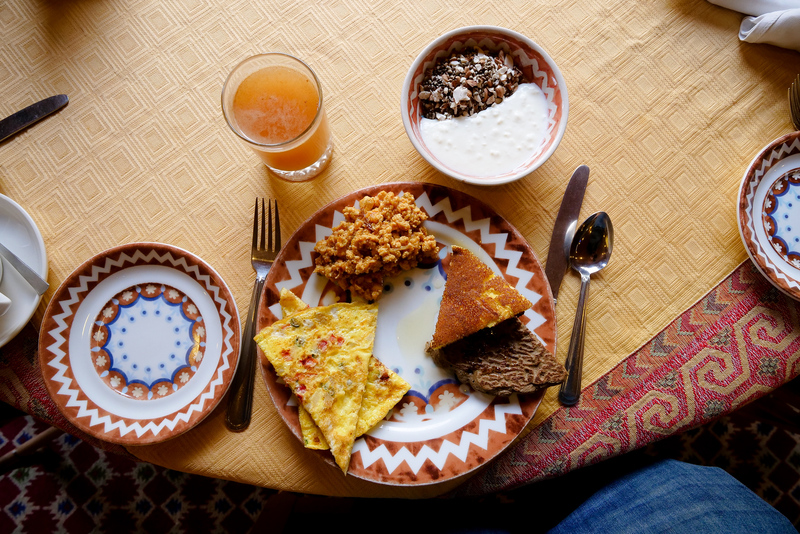 We ate this great breakfast at Hunza Serena Inn, where they responsibly source their own organic honey, assisting local farmers in production and fair sales. Baltit Fort is a beautiful landmark of the town of Karimabad (the largest town in the Hunza Valley). Once the ruling seat of the Hunza Kingdom, it has been standing overlooking the valley for over 700 years. 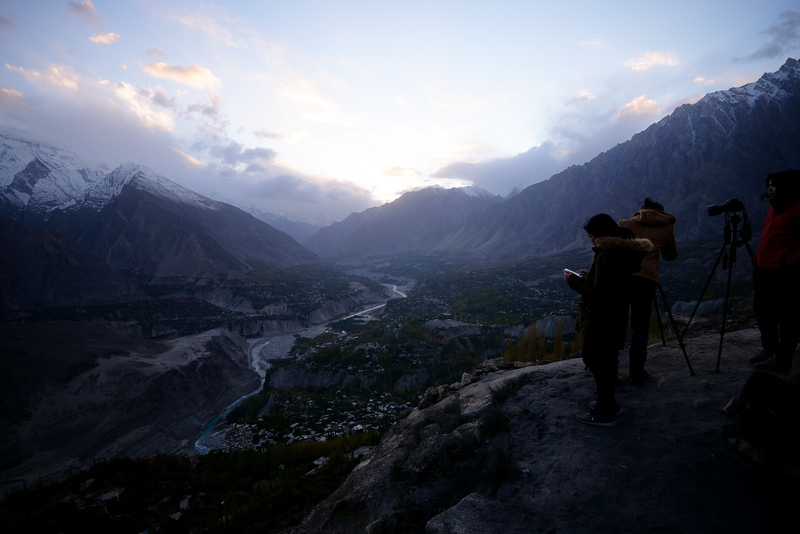 It also means that this is one of the best places for an entire view of both Karimabad and the Hunza Valley. The climb up may be strenuous for some, remember to take time to allow your body to acclimatise to the Hunza Valley high elevation. The short but steep ascent is worth it though – the views here are stunning. You are also in the perfect place to enjoy a few snacks on the way down, an immediate reward for your morning exercise. Expensive bottles of mineral water can’t compare to the life-giving benefits in the water that Hunza residents drink for free. Some of the longest-living people on planet earth, scientists have named this glacial drinking water as the number one life-prolonging secret of the Hunza Valley. Hunza Water is not a joke, it comes from Himalayan-glacial melt, has an unnaturally alkaline pH-level (meaning high pH), and “extraordinary levels of active hydrogen.” The Hunza Valley region makes this possible due to the remoteness of these mountains (remaining free of pollution). Some other countries have now learned to ionize their water to resemble Hunza Water, perfecting things like tea ceremonies, or hospital-grade sanitation. We enjoyed drinking directly from a glacial-stream flowing off of Mt. Rakaposhi, during the drive from Gilgit Town to Hunza Valley the day before. The water glitters like crystal, is of course icy cold, and very refreshing. Apples are probably the most famous produce from Hunza Valley, and you can see orchards reaching up the mountain sides in all directions. They have many different varieties, sweet, crispy, tart and juicy – if you see an apply tree, try eating one while its still attached to the stem. This valley is sitting at a perfect altitude to grow many fruits that may often be extremely expensive in other parts of the world. Make sure to try the locally grown almonds, walnuts, apricots, and grapes. If you want a taste adventure, look out for the very sour but delicious-smelling local species of quince (also called a ‘Queen Apple’). Dried fruits are sold everywhere in local shops, and are a big part of the sales at the local Karimabad Market. These are also exported to larger shops elsewhere in Pakistan, so buying them here usually lowers prices. Spend 300-500PKR for large bags of dried mulberries, grapes, persimmons, walnuts, and almonds, and then anywhere from 150-350 for dried apricots, depending on quality. After lunch, you have a decision to make. 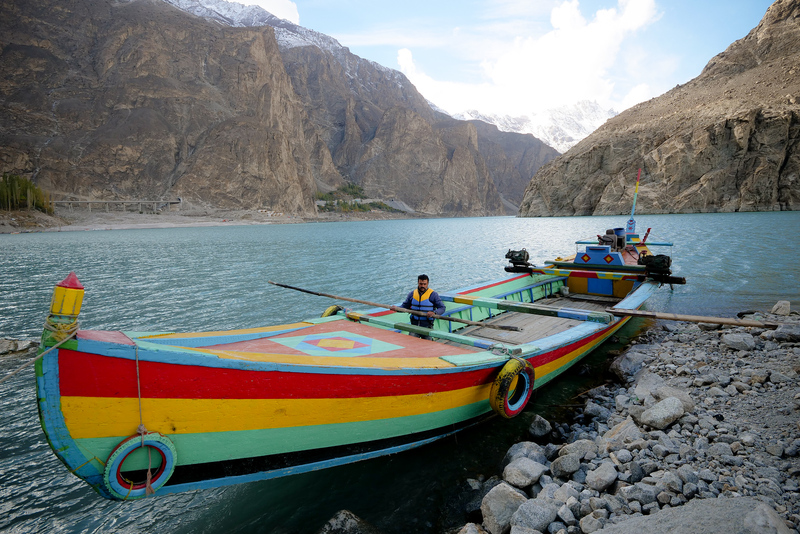 If you have your own transportation, or have access to a rental vehicle, I would recommend the short trip to Attabad Lake, one of the truly majestic attractions near Hunza Valley. The stunning beauty of Attabad Lake (sometimes ‘Atta Abad’) is the result of a massive landslide in 2010. The lake rests entirely surrounded by towering steely gray rock faces of the Karakoram Range. The lake surface reflects a color of the most vibrant blue, it literally must be seen to be believed. There is a wonderful restaurant next to a roadside viewpoint, stop here for a cup of steaming dud pathi milk tea and enjoy the panoramic lake view. If you walk down to the lakeside itself, there are boats waiting to take you for a 15-30 minute trip around the lake. Walking outside in the brisk Hunza air is a wonderful change from the hot and humid Indus River Valley, and right about now you should find yourself quite hungry for a warming and hearty local lunch. I recommend eating at Hunza Food Pavilion, where the amazing Aunty makes completely authentic local Hunza Valley dishes, all the cooking done in-house and done fresh. Run by two ladies who don’t start cooking until you order, so you know that every dish is fresh. The Aunties are quick to tell you their food is all organic, and most of the ingredients they use are actually home-grown. 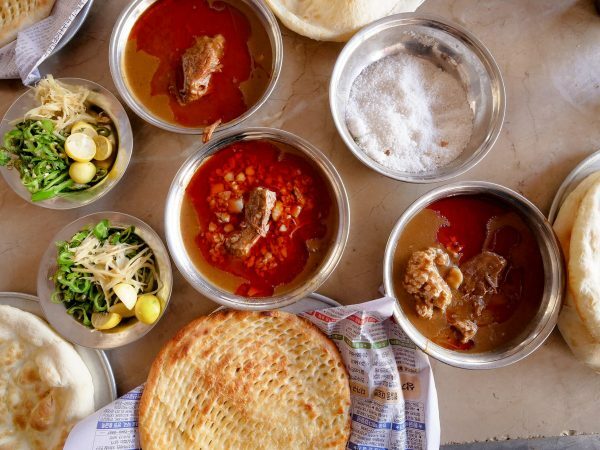 The cooking here is full of authentic local Hunza flavor, and here are just a few examples of local Hunza food at the Pavilion that we tried. Hand-cut noodles made from local wheat, dowdo is usually made with minced chicken meat. Adding a few slices of onion and cilantro, seasoning with cardamom and cumin, the soup itself a golden, buttery broth. 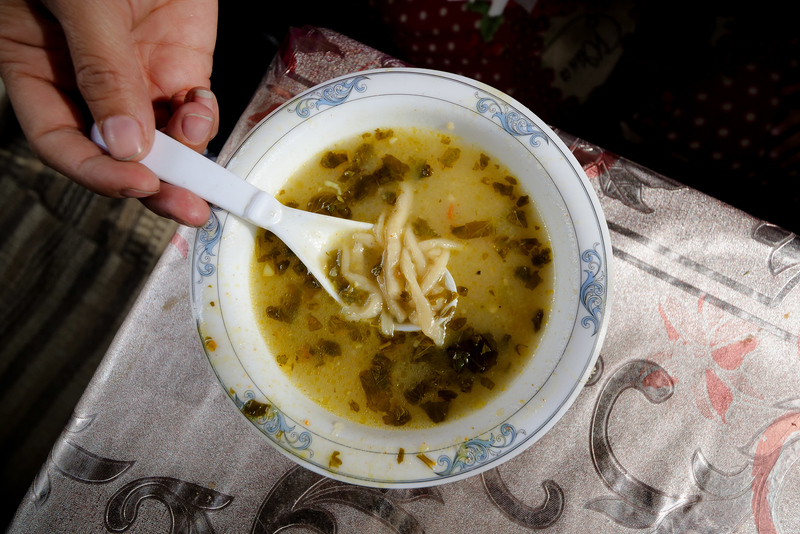 Dowdo is one of the foods you have to try during your day in the Hunza Valley. I think Hunza Food Pavilion served the best single bowl of it out of all the versions we had. The bowl of dowdo they serve here is incredibly warming, the gently spiced minced meat smells wonderful, and I love how the broth is so buttery and creamy without being heavy. You might see advertising for this ‘Hunza Pizza,’ but I think that chapshurro is an amazing dish on its own. Common to find it full of minced beef, actually the traditional chapshurro recipe uses spiced yak meat. The seasoning is simple, with a few additions of chopped onions, red chilies, small local tomatoes, and coriander leaves. 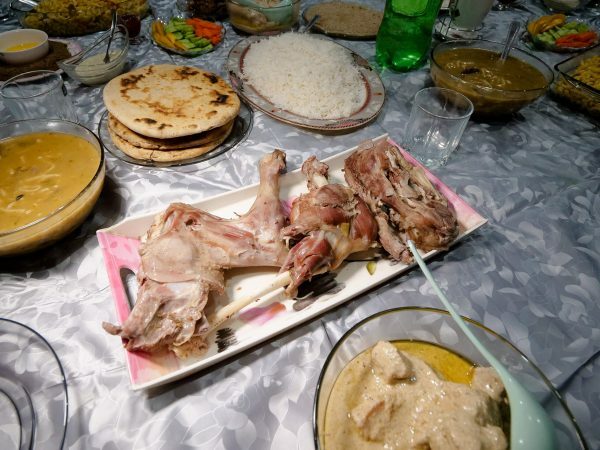 This dish is a wonderful example of the blending of local ingredients with cooking styles common to Central Pakistan. 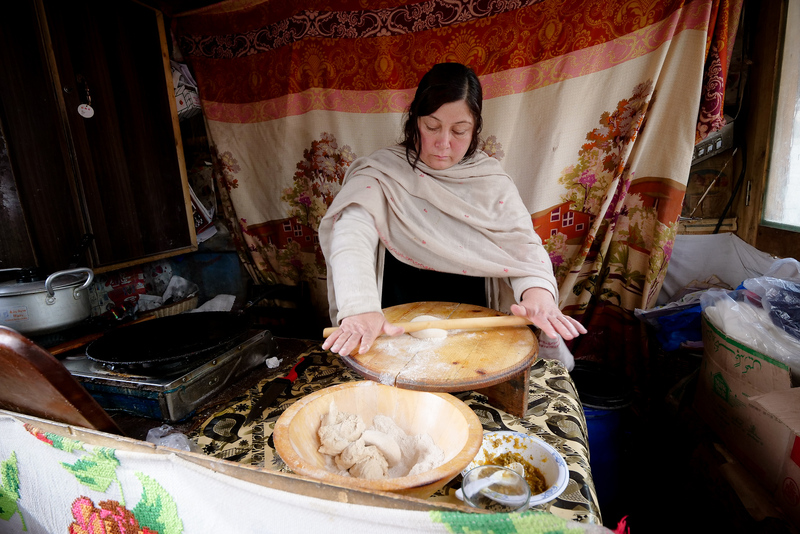 The piping hot, very filling chapshurro meat pies are one of the most widely-available (but wonderful) dishes you’ll find in the Hunza Valley. This cheese-filled flour cake is another hearty dish, perfect for those living and working in cooler mountain conditions. The cheese in this recipe is from goat’s milk, and is traditionally a staple food in both Hunza and Balti cuisine. Flour is rolled out, and apricot oil is spread liberally on each side before the cake fries lightly on a hot iron skillet. Cheese filling is added, and then another thin cake of flour is set on top, the whole cake cut cross-wise into triangles before serving. Sometimes the ladies serving here work together, and other days they take turns cooking individually. If you did not visit the Attabad Lake, then you might have some free time to visit the Altit Fort before your climb to the Eagle’s nest. Don’t wait too long though, because you don’t want to miss the incredible view of the sun going down over the valley. 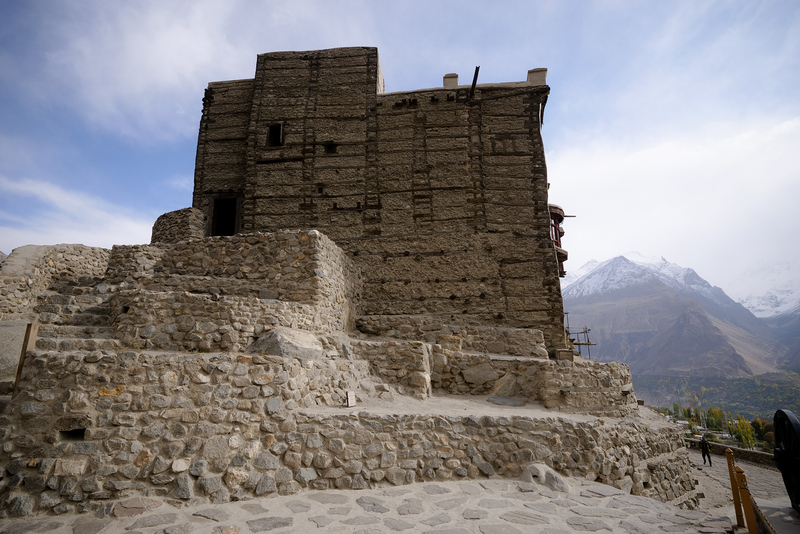 Altit Fort lies part way up the climb to the area called ‘Eagle’s Nest.’ This was the original fort structure of the Hunza Valley, built in 1100 AD, the seat of the kingdom which moved to the Baltit Fort a few hundred years later. If you have to choose, then I would recommend the Baltit, simply because its larger, and has a better view, but both are full of history of the Hunza Valley and its ancient kingdoms. In these temperatures, if you’re like me you will almost always be wanting something warm to drink or eat. 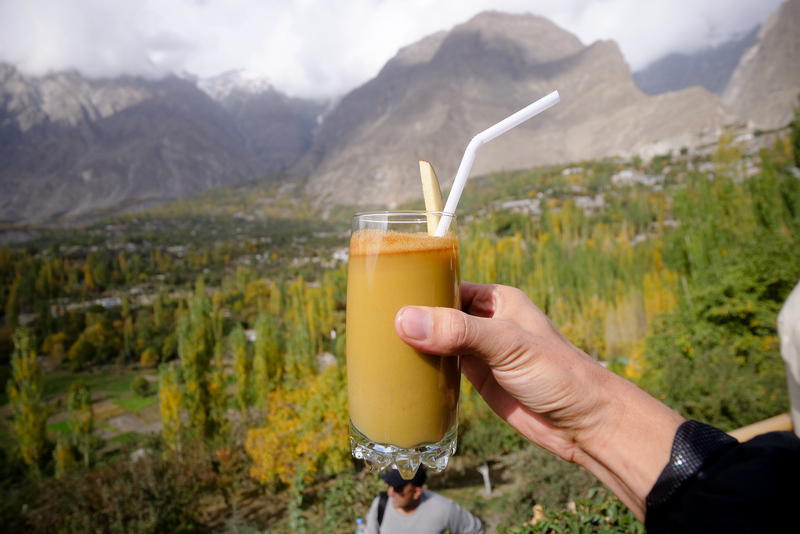 Coffee is only recently popular in Pakistan, but due to the amount of foreign tourists (usually on their way to trekking in the Karakoram mountains), coffee is available at many places in the Hunza Valley. Serving both local and European style snacks to have with coffee, the walnut cake at Cafe de Hunza is great. Also try the local herbal tea, with ingredients native to the nearby Pamir Plateau. This is one of those views that you will probably remember for the rest of your life, and one of the top things to do in Hunza Valley. Climbing up to the Eagle’s Nest really takes some effort, but the view is breath-taking. Even in the sub-zero temperatures, I was in awe – seeing this view of endless 7,000-8,000 metre high jagged and snowy peaks, I almost forgot about the chilly air. For me it was one of the highlights of the entire trip, this is something you should not miss on your day in the Hunza Valley. Note: It can get dark very rapidly up here, there are security guards walking around with torches, but still be sure to watch where you are going as there are several winding and unmarked paths on which to get lost. 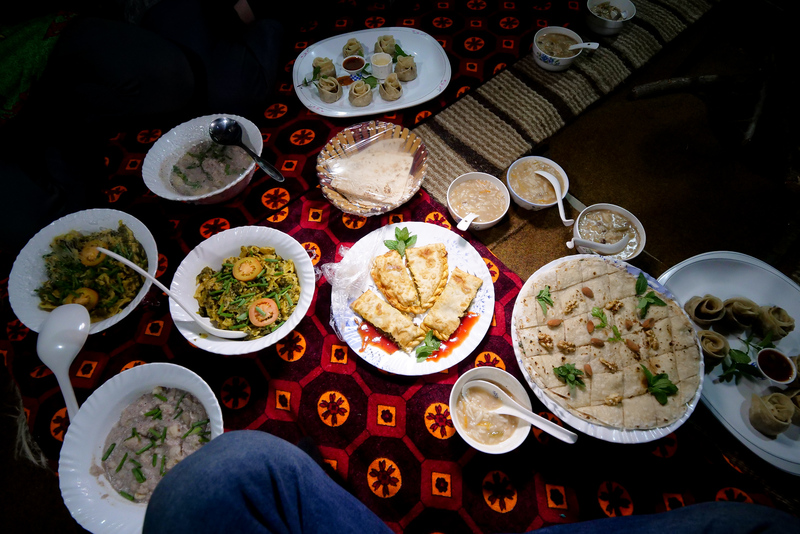 There is no better way to experience the authentic local culture in the Hunza Valley than sharing a meal with a local family. I have to thank our good friend Ali of Pakistan Travel Mart for making the arrangements, and this incredible meal possible. Expect rounds of tea and after-dinner snacks to stretch well into the night, and this actually too turned out to be one of my favorite memories from this entire incredible Pakistan trip. I encourage you to check out the video of our experience here, or read the entire article written on this meal here. I won’t go into all the dishes, but it was a meal of amazing food shared with a heartwarming welcome. The details of some of my favorite dishes from this night are here. 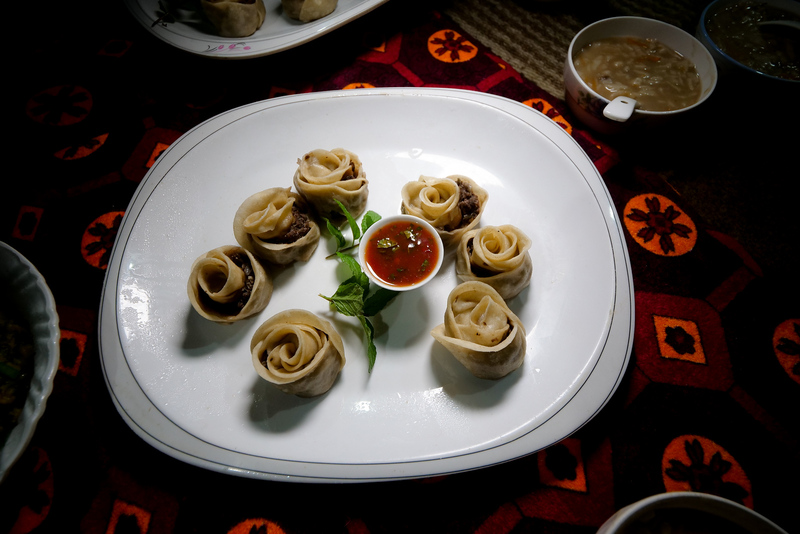 You may already have come across signs for these at small shops in the Karimabad market, these artful dumplings have a rose shape but do not contain actual rose flowers. This is a special dish, if not store bought then they are usually reserved for special occasions, due to the time required to make each rose dumpling by hand. Harissa is made from pre-boiled meat and peeled local brown wheat. The chef tears the meat into strips after it boils first on its own. These strips go into a bowl with the wheat, along with healthy servings of apricot oil, and continue to cook to make a delicious and extremely thick stew. A dish of few ingredients, this is another recipe that Baltistan eats on a day of special occasion. 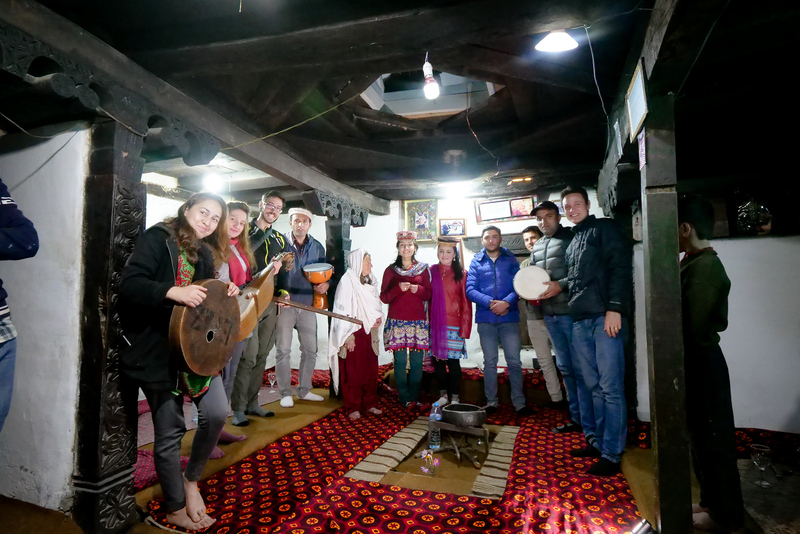 Having the chance to eat local Hunza food with an amazing community of people was a privilege, and it turned out to be – even greater than the beauty of the mountains themselves – the highlight of visiting Hunza Valley. The Hospitality in Baltistan is incredible. For those interested in going out and sampling the local nightlife, there are quite a few places in the central streets of Karimabad staying open until midnight or later. For myself, although these are not so interesting, I recommend taking a few minutes to walk outside in the crisp mountain air and enjoy some of the most wonderful star-gazing you’ve ever seen. The high altitude, low humidity, and distance from any major city, mean that the light pollution here is extremely low. Find a dark place, give your eyes time to adjust, and let the amount of stars visible in the Hunza Valley night sky add a whole new dimension to this magical place. To finish this local food and top things to do in Hunza Valley guide, I just wanted to share a few details about how to travel to Hunza Valley and Gilgit-Baltistan. Part of the fun of traveling in areas like this, no matter how remote and other-worldly they may seem, is how it is still very possible to visit, and visit safely. This area is has only recently become accessible to outsiders, even people within the country of Pakistan are just starting to visit. People are just starting to appreciate how wrongly the media has portrayed these areas, and many other areas like this all over the world – the people here could not be more lovely. The first roads ever built to GB from the capital of Islamabad are still not even 40 years old, so by land travel there is only one route to take. 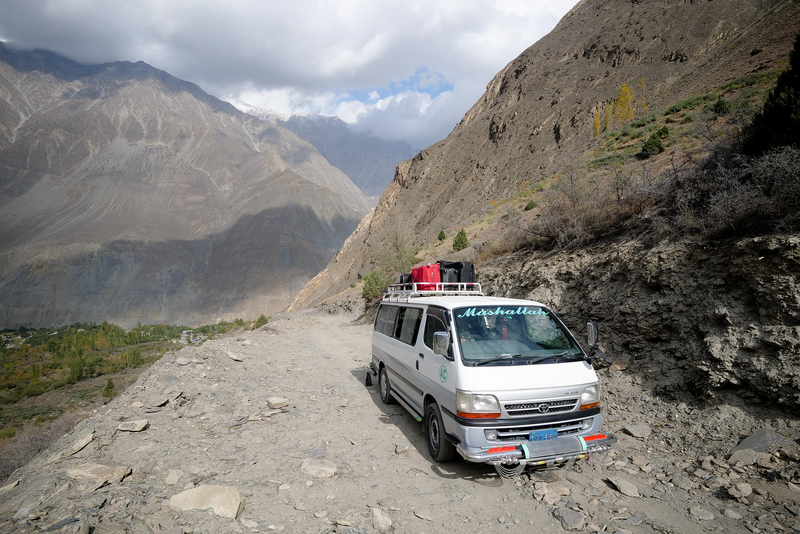 Many bus companies operate between Gilgit and the Hunza Valley, or another option is renting a car, or your own van (with driver). For a visit to the incredible glaciers throughout this region, there are also options to rent more adventure-capable vehicles. We took a flight from Islamabad to Skardu, and then drove to Gilgit, after an incredible visit to the Deosai National Park on the way (be sure to check out the video from that day here). 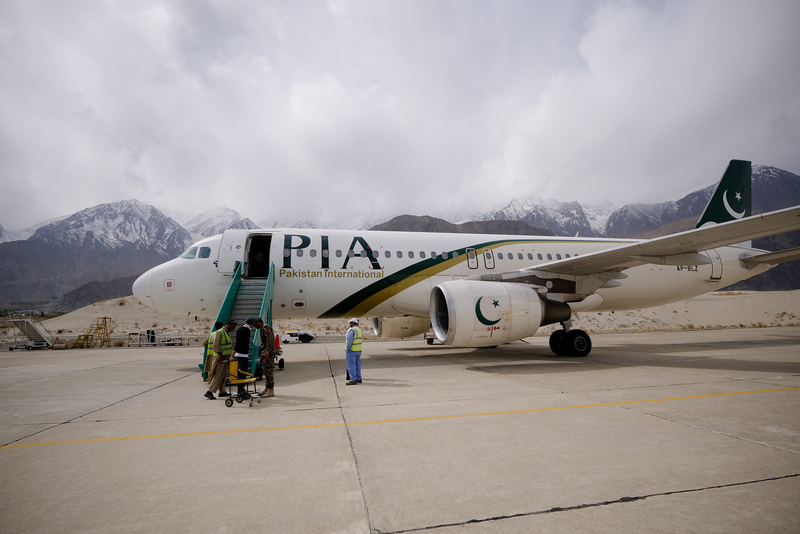 Alternatively, depending on the day, there are 1 or 2 direct flights daily between Islamabad and Gilgit (link here), and also flights from Islamabad to Skardu if your day in the Hunza Valley is part of a longer trip. Note: Depending on which passport you are holding, you will likely need to sign into a local Immigration at any of the regional airport. Be sure to keep track of the arrival card (police will ask for it at road checkpoints during your stay in the GB region), and you will need it again for your departure. I cannot comment personally on the trekking or adventure travel in this region, but we did see several adventurers on their way to climb the giant Nanga Parbat. 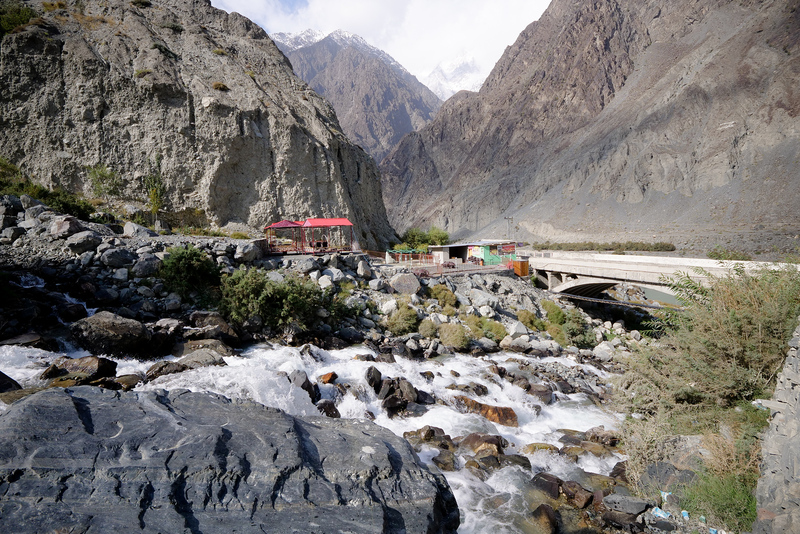 Karimabad is the last stop before the week-long hike to base camp. To get a visa, you will likely need to be the guest of a local organization (like we did with Pakistan Travel Mart), or a tour company. We saw many people visiting with the purpose of photographing the amazing and rare local Hunza valley wildlife. There are Markhor and Ibex, massive mountain goats, and even snow leopards for the patient and fortunate photographer. For Drone and aerial photography, be sure to check for the latest information. In the GB Northern Province, drones and drone photography has very strict regulations. There are many organizations, but also many single visitors and volunteers working in the Hunza Valley. We met a team of doctors visiting to promote health and healthy living awareness concerning things like water and hygiene. Here is a link to another organization working in the area. I hope this Hunza Valley travel guide gives you some ideas, tips, and practical information for your trip to Hunza Valley and Gilgit-Baltistan. What I can tell you with certainty about Hunza Vally, Pakistani is the scenery is otherworldly, the food is unique and refreshing, and the people will show you hospitality that will warm your heart. 44 comments. I'd love to hear from you! You are most welcome Tarun, thanks for reading! What an epic view! 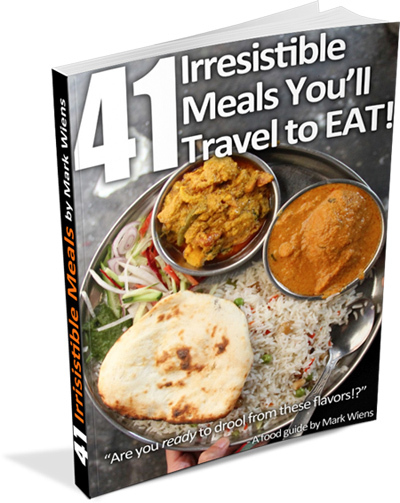 This guide is great and very well written. All the information needed is in the guide, even the time. I will probably add this on my bucket list. It’s different from what I’ve heard about Pakistan. Aryan, thank you so much, those are very nice words! Thanks for the support, and I really wish you well on your upcoming visit (bucket list items are great, but try to do them as well! We only live once… 🙂 ) Take care, thanks for reading, have a great day today! Awesome pictures! I can’t wait to visit Hunza – hope to be there next June. It has always been a dream of mine to visit the north of Pakistan. Chris! That is so great, I know you will enjoy yourself immensely. Northern Pakistan was so different too from the other parts of Pakistan we saw, if you have time, might I suggest that you at least spend a few days in another part as well (Peshawar? Lahore? ), it would give you even more grounds for comparison. Enjoy your trip man, and thanks for reading! This is very nice article about hunza valley. your pictures are just amazing. thanks for this amazing content. Thanks very much Gayatri for your continued support! The Local Family Which Served Authentic Local Homemade Food In Hunza In The 400 Years Old House, Owns A Cafe By The Name Of “Cafe Culture Hunza” You Can Try All The Meals Mark Tried In That Cafe. I followed your adventures throuh Pakistan, and i’m impressed you and your family were able to travel around with no issues and enjoyed every min! thanks for sharing the experience. Now… what travel company did you use for your travels in the Gilgit-Hunza area? in the 4×4’s? i’m planning on going, and would like to use a reputable company to tour with so i know i’m in safe hands. Hi Kas, thanks for the message! We did use 4×4 vehicles, and we needed them on two different times – The drive from Skardu to Gilgit was quite long and on rocky/dirt roads for most of the way (maybe 8 hours out of 12 total), and then in the Deosai park area, the 4-wheel drive helped a lot as well. Our friend arranged the rentals, so I am not sure what company he booked through, but there were many other travelers who did the same (using large vehicles to go around themselves, not booking with a tour company). Good luck, and enjoy your trip! Abhinav, thanks for the commen – yes, that area was gorgeous, just mind-blowing beauty! This place looks heaven !! 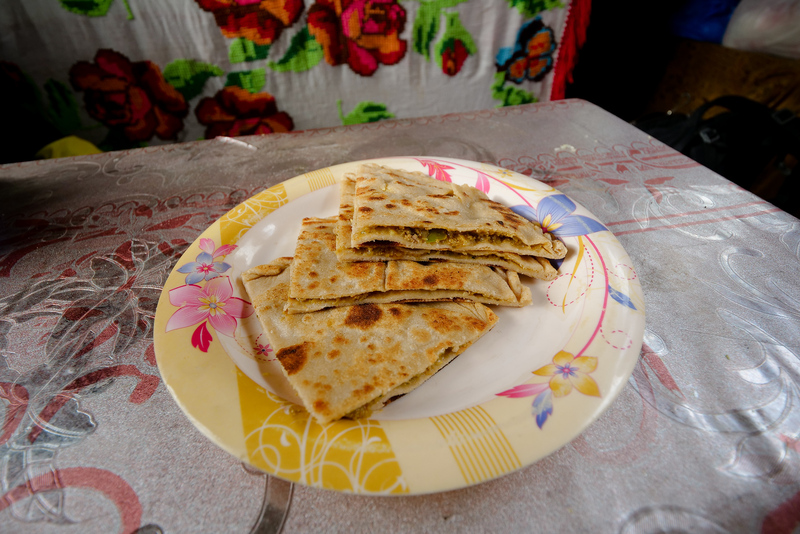 The entire Pakistani series was one of your best .Can you tell me the name of the dish under home cooked traditional dishes .The whitish flat bread [roti] cut in small pieces garnished with some nuts and some green leaves? Do you know what it is made off? looks so good .Thank you for showing us this place . This place looks like heaven !! The views are just mesmerizing ,the food looks super delicious too .Can you tell me the name of the dish in the pic above with home cooked traditional dishes .The whitish flat bread[Roti] cut in diamond shape garnished with some nuts and green leaves looks delicious . This looks like an interesting place to visit! The mountains are stunning! I am one of your huge fan! Love the complete and details from your website. I usually save those beautiful photos and set as my wallpaper. I hope you don’t mind. In your latest series, the attabad lake is so beautiful! Can you upload a few more photos of this lake? Your photos are so good in quality and resolution that only yours can fit my computer’s screen. Anyway, just some greedy request here. Once again, hope you don’t mind idol! Hope you are travelling well again now! Thank you very much Candice, and really appreciate your support. No problem at all, glad you like the photos, let me see if I can find some more. Hope you’re doing well. This looks awesome, wish to visit Pakistan one day. Thanks a lot Mark! I just planned a solo trip to Barcelona because I saw your video in La Boqueria (and because I found a really good deal on the flight tickets), I recently watched your video an read the history behind your blog. I just love you speak from your heart (everything is about prioritizing things, a wise advise!) and do really good shoots of the food. Just wanted to say thanks, I enjoy a lot every video you make. Truly amazing! The food of course, the majestic views, the extremely nice hospitality! I enjoyed this blog and the Youtube video a lot. Love from India! Love to visit in this coming Feb.
My one dream is to witness the beauty of Pakistan. One day in God’s Will. Thank u mark..for showing such a beautiful side of my country. I dont knw in what month u visited hunza coz its cherries are worth eating during june.Do come next time and enjoy those fresh cherries. A perfect description to the most beautiful part of the world. The people, the spectacular landscape, gorgeous mountains and the local food make your trip worth everything. I cherish everything Hunza valley has to offer – the glacial water, apricots (In all their glory), cherries, goat cheese, Hunza herbal tea, dried fruit, the history, the culture, the hospitality and the many stories people share. A wonderful read to start my day with memories of Hunza valley. Mark yes this trip to hunza is amazing and the artical is very informative. Living in pakistan but still to go hunza is my bad luck. Hopefuly this might happen soon inshallah. God bless you and thanks for comming to pakistan. People in Pakistan deserves RESPECT. In return you will have so much Respect and Love it would be hard to carry back. Simply loved your article. i CANNOT wait for where to next! !